Bali is proved a safe destination and worth visiting since some International events are hosted in Bali. Don’t miss the opportunity in the coming months to visit Bali, particularly the Northern coast, and feel the experience at Adirama Beach Hotel & Restaurant along with its convenient facilities. Your Pound, Dollar, Euro will go a long way. Come straight up to Lovina in the north where your money goes even further and avoid the crowd in the southern part of Bali Island. Take a bus, jump in a bemo, hire a car or find out any good reputed travel agents.At Adirama Beach Hotel you will not be disappointed whether in terms of sceneries, facilities, services, staff’s friendliness, beaches and more…..
Adirama Beach Hotel & Restaurant, which lies on Jalan Raya Lovina, Singaraja – North of Bali is absolutely offering the friendliness and romantic home-base, an ideal location to relax and discover the beauty and peacefulness of this Northern part of Bali. Smell the flowering shrubs and tropical plants, enjoy a delicious sunset dinner at the beachside restaurant! Go and watch the dolphins, snorkel and enjoy the fresh fish from the traditional fishermen! Remember, you will be able to experience all of this if you stay here at Adirama Beach Hotel. 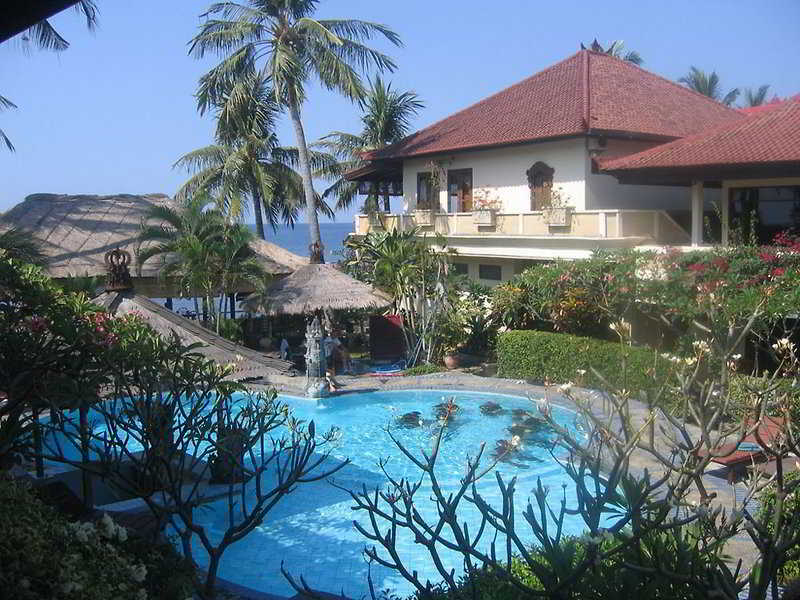 Lovina Beach is of course ideal for those who are fond of calm waters (no surfing) and volcanic sandy beaches. You may even encounter some local dolphins along the beach and the accommodation is very good value for your budget. Staying at Adirama Hotel leads to many alternatives to hang around. To the west of Singaraja a string of secluded black sandy beaches offer a peaceful alternative to the bustling hotel resorts of the south. A long coral reef runs parallel to the shore, and the clear waters, as calm as lagoon, offer excellent snorkeling, sailing, wind-surfing and dolphin tour, right on your hotel beachstep!